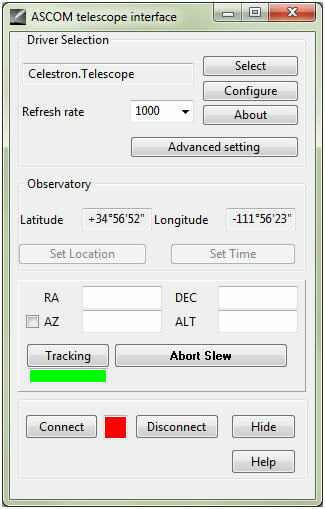 This guide describes how to connect a Celestron telescope mount to your computer over Bluetooth using ASCOM drivers which will allow you to control the telescope mount using standard ASCOM based astronomy software. Our test setup is based on a Celestron telescope GT Mount with NexStar+ hand control (serial port based only) and the operating system is Windows 7 64-bit. This setup has been tested and confirmed working with the following software and mounts but will most likely work with all ASCOM based software; and since most mounts mainly works the same way we expect it will also work with most (possibly all) mount variations. 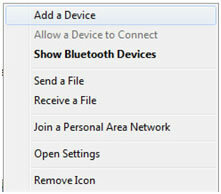 You will need a computer with built-in Bluetooth or a USB Bluetooth dongle if your computer does not have built-in Bluetooth. The serial Bluetooth adapter is connected to the hand control via a RJ11 to DB9 female cable. The hand control (serial port based only) is then connected to the telescope mount. 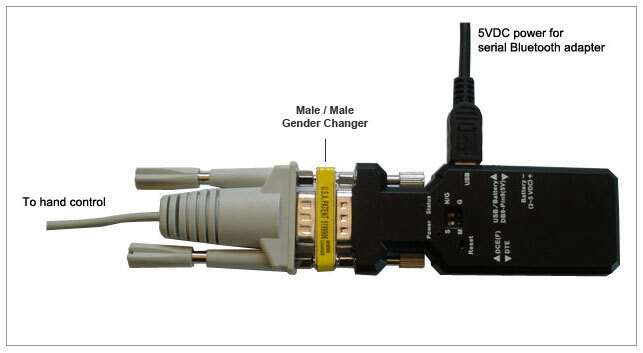 You will need a male/male gender changer to connect the serial Bluetooth adapter to the DB9 end of the RJ11 to DB9 cable. Below is a list of parts we use for this setup; some are required, some are highly recommended and some are optional. If you want a stronger signal. part CN05B You will need this to be able to connect the Serial Bluetooth adapter to the RS232 end of the RS232 / RJ11 cable which is connected to the hand control. www.celestron.com This cable is used for connecting the serial Bluetooth adapter to the hand control. part XS882 This part is optional in most cases and only needed if you need to change the serial Bluetooth adapter's settings. In most cases this is not needed since most telescopes has 9600bps as default. Alternatively the Bluetooth adapter's baud rate can be changed over Bluetooth however this can be a challenge if you are not familiar with this process; using this USB to RS232 adapter is much easier. part ES-388 You only need this USB Bluetooth dongle if your laptop or desktop computer does not already have Bluetooth capabilities. part 206647 This rechargeable lithium USB battery pack is optional but very useful if you have no other power source for the serial Bluetooth adapter. Make sure you have the latest ASCOM drivers and Celestron drivers installed on your computer. Now you need to pair the serial Bluetooth adapter with your computer. Two serial ports, an incoming and an outgoing, should now show up under the “COM Ports” tab. 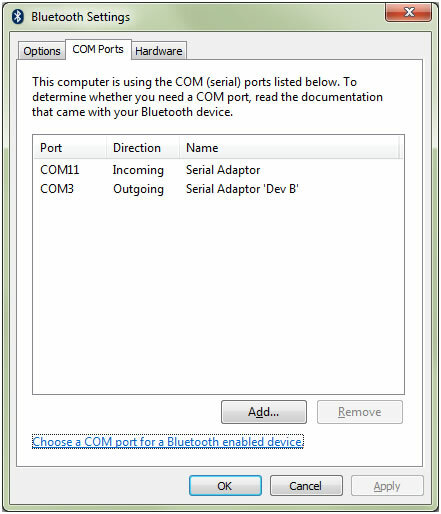 In this example Windows has created COM 3, which is called “Serial Adaptor ‘Dev B’”, this is the port we are going to use since this is the outgoing port for the serial Bluetooth adapter. 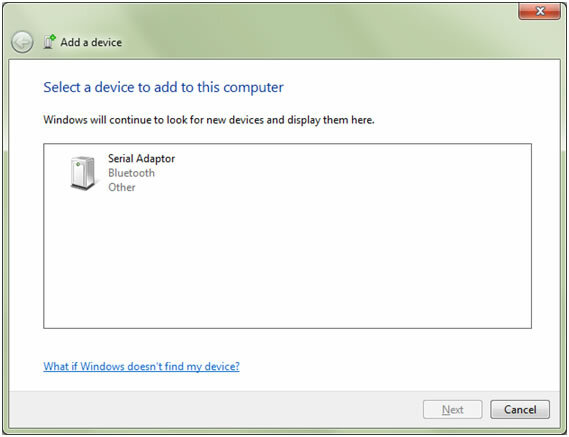 The serial Bluetooth adapter is now paired with your computer and ready to use. You are now ready to connect your computer to the hand control via the serial Bluetooth adapter. First connect the serial Bluetooth adapter to the hand control using the RS232 / RJ11 cable and the male/male gender changer. 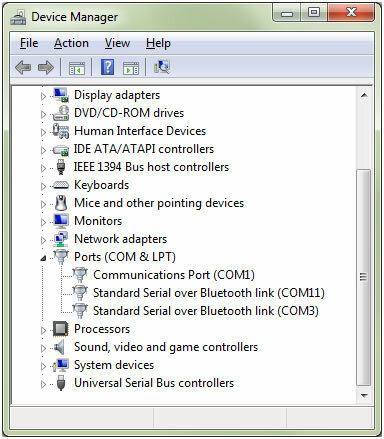 Below is an illustration of the connections from the hand control cable to the Bluetooth adapter. 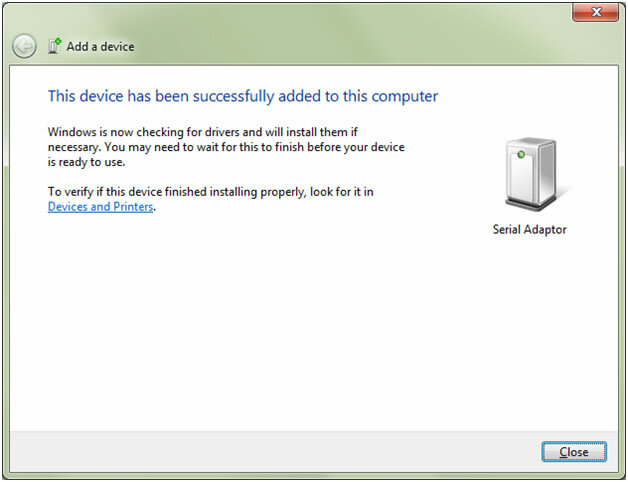 NOTICE: The DCE/DTE switch on the side of the adapter must now be in position DTE. Align your telescope using the hand control or other means. Start Cartes du Ciel. In the menu line click ‘Telescope’ -> ‘Telescope Settings’ and select ‘ASCOM’. Click ‘Telescope’ again and then click ‘Control Panel’. 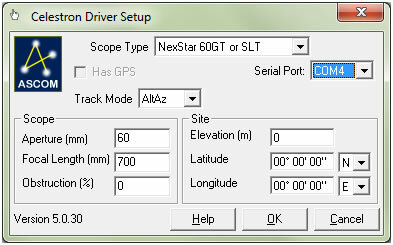 Click ‘Select’ in the ASCOM telescope interface window and then select ‘Celestron Scope Driver’ from the dropdown menu. Click the ‘Properties’ button and set the serial port number to the number created by the Bluetooth dongle; in this example COM 3. Select the Scope type and click ‘OK’. 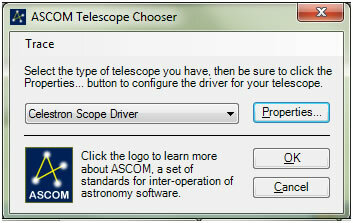 Also click ‘OK’ in the ASCOM Telescope Chooser window. 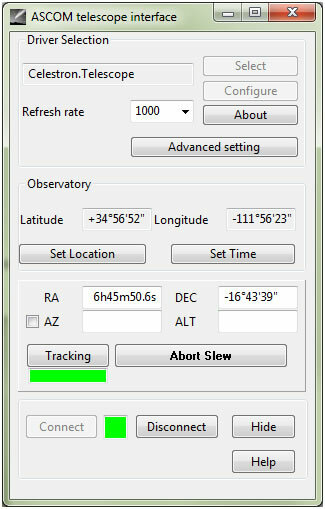 You can now control the telescope mount by clicking on a star in Cartes du Ciel and click the ‘Slew’ button. Once you are connected the red and blue LED lights on the serial Bluetooth adapter should be solid on. 1. 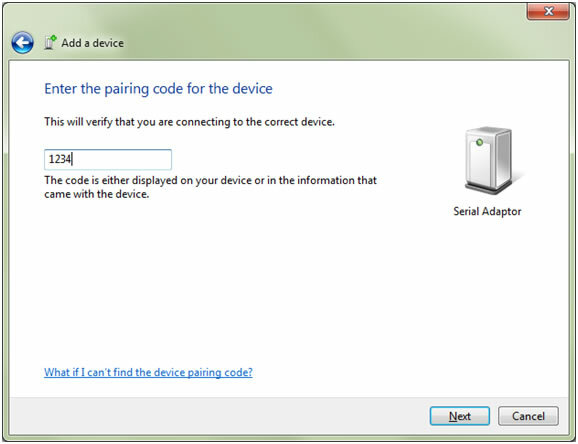 You have either connected the serial adapter incorrectly or the baud rate command was not properly set or the COM port has not been successfully created. For the two first reasons you will need to recheck your setup and confirm that the serial Bluetooth adapter's baud rate actually is 9600. If the serial Bluetooth COM ports for some reason has not successfully been created a computer restart usually helps. Check the COM port numbers after restart.